Culture tourism or tourism culture? The most beautiful aspects of Balinese dance which leaves an unforgettable impression on visitors are the locations and spaces where dances are performed everyday of the year. The architectural beauty of temple entrances, the ambience of blooming frangipani trees, the subtly lit courtyards of palaces, the long bamboo poles adorned with flags swaying in the island breeze, fire lamps circling the stage.....the whole picture is one of aesthetic pleasure for the viewer. Bali (Indonesia) is an island of beauty and Art. The people are gentle, practice their version of Hinduism, believe in tradition and dance like angels. Visiting Bali again after a decade filled me with enthusiasm on the one hand and trepidation on the other. I knew things would have changed, but hoped the old atmosphere was not forsaken entirely for tourism. The famous city Ubud, an ancient capital with a royal palace in central Bali is still a centre for the Arts, but has become over crowded. However, there are still many spots in Bali which have a quiet charm, not yet over run by tourists. For me, the performing arts and rituals of Bali are magical experiences. The old official policy (from the mid twentieth century) to maintain Bali as a Hindu Island and support all the dances and the customs for the sake of tourism was indeed a pleasant surprise on my first visit decades ago. Now it is common to find performances everywhere every night with the haunting music of the drums and the Gamelan reverberating in the air. The annual Bali Arts Festival showcases every performing art form as well as the plastic arts. It is a series of events full of exotic performances, costumes, parades, dances, puppet shows, art exhibits and more. Such an extravaganza is perfect as an introduction to the many facets of art in the island. The dances of Bali rely mostly on the Ramayana for a script. With alacrity and gentleness these trained dancers perform with soft gliding footwork, sinuous body movements and graceful gestures, wearing the prettiest costumes and accessories. The Ramas, Lakshmanas and Sitas of Bali are truly celestial in appearance. They dance with a very firm technique, using sculpturesque poses, dressed in typical draped fabrics, and crafted crowns. The dance tradition is hundreds of years old, with some having roots in the royal palaces of ancient Java. Obviously there is a good Guru parampara still intact. Children perform effortlessly and practice in groups in the halls attached to temples. The adult dancers are mostly part timers. They follow their tradition with sincerity. Since the shows feature many dancers in solos, duos and groups, there are no prima donnas here. Legendary dancers were performing years ago when the Western world discovered the island’s attractions. Perhaps they are still there in some remote villages. New choreography too is finding a place in the arena. The character of Hanuman is a hero and is very popular, as he wears a mask, sports a tail, is clad in white and leaps about providing much excitement. He also doubles up as a comic character, doing impromptu interludes involving members of the audience. Ravana makes dramatic noises and howls as he enters, wearing a grotesque mask, dressed majestically with a cape fluttering in the breeze (most dance performances in Bali are held in the open air). Demons, angels, birds like Jatayu are all dressed in elaborate beautifully crafted costumes, masks and head gear. The quick unfolding of the story from the scene of exile in the forest through the abduction of Sita and the final Rama- Ravana battle, is a typical Balinese style of scripting. Within an hour the whole drama is enacted with dramatic sounds emanating from the orchestra. Few or no songs are sung, but a few dialogues are voiced with effect. Seeing the same story enacted with a full-fledged group of men chanting the KECHAK (sounds pronounced in rhythmic sequences) forming the background score to the drama is an equally exciting experience. There is no orchestra in this performance, just the KECHAK chorus, chanted in a haunting variety of harmony. The exotic setting for this performance was breathtaking. On a steep cliff in the region of Uluwatu, overlooking the Indian Ocean stands a temple which they say is more than a thousand years old. The many shades of the blue sea, about three hundred feet below looks beautiful as the white waves crash on the rocks. A special amphitheater has been built for the dance with the vast ocean as the backdrop. As dusk settles on the temple, the sky at sunset lights up in shades of orange and pink. At the centre of the stage is a tall lamp. An old priest walks towards it and lights up the four arms of the lamp with a small fire and does a typical Balinese puja to sanctify the stage. Soon the KECHAK chanting group of about fifty odd men dressed in the uniform black and white checked sarongs and red sashes enter. In a choreographed series of moves they do formations of concentric circles, standing, waving their arms in unison above their heads, and then continue floor exercises seated, drawing us gradually into a magical soundscape of drama. Suddenly the actors enter the circle and the story unfolds. The dramatic end is a stage picture of Lanka encircled by flames. Bali has a big repertoire and variety of dances - Legong, Kris, Baris, Barong and so on, each with typical characteristics. Some are meant for girls, some are for masked men, and some are martial, with demons and dragons swishing their tails while their huge masked faces leap about in fierce encounters. The mystery of the trance dances where daggers are used for daring attacks is enhanced by being performed on stages lit only by fire torches. The stages are the most attractive elements in Balinese performances. One cannot help thinking why we in India do not use our smaller temples as spaces for performances. The charm and architectural ambience of the Balinese stage is truly one which Indian dancers should envy. Puppet shows and masked dances Wayang Wong and Wayang Kulit are part of the Bali performance tradition. The short and sweet dance dramas are a delight. There are many ritual dances performed on auspicious nights like the full and new moon, in old temples. Local people from surrounding villages come with their children and sit late into the night to watch such events. 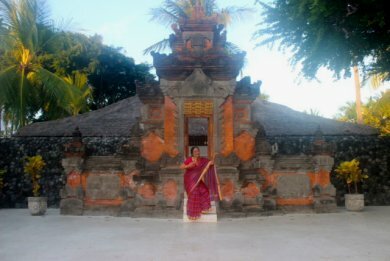 Bali is an ideal place where culture tourism is working very effectively. Our Southern states have the dances as well as the locations for emulating the Bali example. We need a culture tourism policy, a decent infrastructure, and the will to implement it, with a fine tuned aesthetic in mind.